Fire-Fast Inferno. 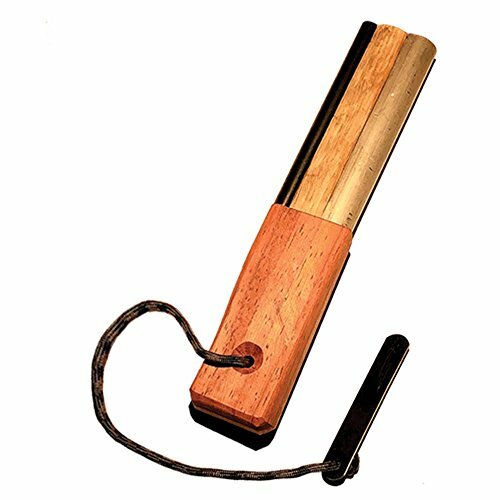 Best Emergency Waterproof Survival Fire Starter. Magnesium & Euro Fire Steel Ferro Rod. Durable Tool for Bushcraft, Camping, Backpacking, Hiking, Hunting, or Bug Out Bag. The Inferno is a true Survivalists fire starter. The Magnesium is 97% pure, 3/4-inch in diameter and 4 inches long. The flint is 3/8ths inch in diameter and 4 inches long. The Inferno weighs 6 1/4ozs, the overall length is 7 5/8 inches. The handle and spine are hardwood and will not rot. The Spring Steel Striker is attached by US made paracord. We use European Fire Steel flints made of Rare Earth metals. Don't be fooled, this flint is superior in every way, will last longer and emit a larger shower of sparks. Rare Earth metals are often mixed with inferior content. The exterior of these inferior flints look exactly like ours but perform poorly. Never accept a substitute. If you have any questions about this product by Fire-Fast, contact us by completing and submitting the form below. If you are looking for a specif part number, please include it with your message.